Hello Ladies , Today i'm going to review dolly wink agains after long time ago no review these brand. As you might have known , I LOVE Dolly Wink and Candy Doll. 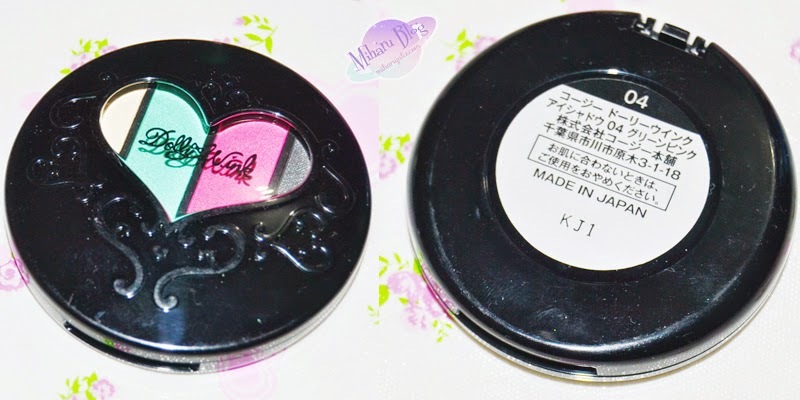 So today , I'm going to review Dolly Wink's Eye Shadow 04. Well, I got No.4 in Colorful Pop few weeks ago. I was so excited to try this eyeshadow that time because of the Colorful Pop color. I got this Eye Shadow from HanaVillage. The Dolly Wink palette contains 4 shades. This is the basic eyeshadow every lady should have. The highly pigmented colors are long lasting. Its smooth texture and natural shade would be one of your must use eyeshadow for all occasions . The highly pigmented colors are long lasting. Every shade combination is made for perfect blend for a subtle look. The little shimmering gives an extra glam for your eyes. Step by Step illustration to teach you how to use the colours . Don't have to know Japanese to understand it, if you want to stay safe the first time using it, I recommend following the easy guide. I love the outside packaging, The black round casing is small and compact, this easy to bring around and hard to get dirty because they come with a black color. They have a simple lovely design with the little heart shaped window on the top lid, allowing the colours to peek out . They provide small black applicator too. As you can see , the colours in the palette are really special. That's also one thing I really like about all the dolly wink palettes. I love the pigmentation. Dolly wink eyeshadow has a natural color result compared to US Brand. If you don't use any base it has a soft and natural result. Dolly Wink eyeshadow has a soft and smooth texture, the result is more like satin with a bit shimmer . Using both brush/ sponge, the color payoff was great. 1 swipe was all it took to achieve the color intensity shown in the picture above. 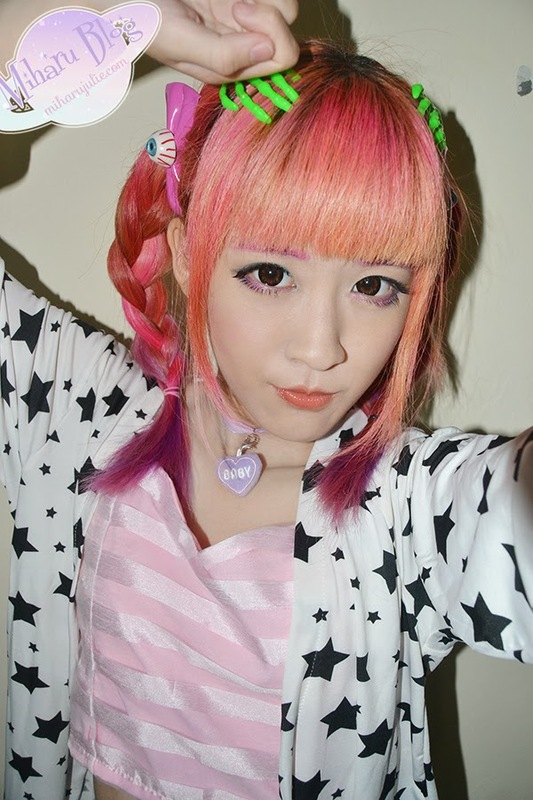 If you're take picture with flash , the eyeshadow would have shine like this below picture. It blends easily and nicely. I did not face any problem in blending and ensuring a smooth transition from one colour to another at all. Long Lasting although i'm not applying eye primer. Thank you for the comment on my blog :) I have followed on GFC!! Hmm would love to try this eyeshadow. You look super adorable in last picture . Thanks for your comment in my blog. I have just followed you , hope you follow me as well . 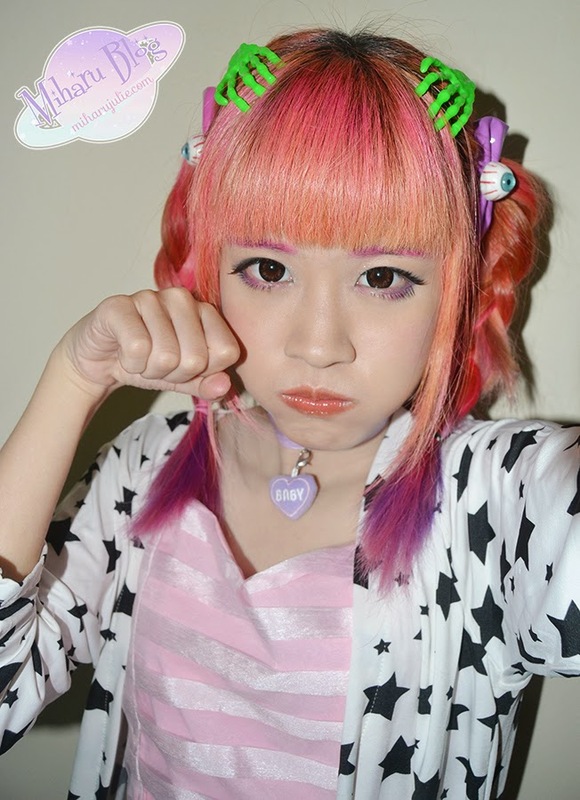 So cute makeup, You are like a doll, already follow You in GFC now is your turn! Thanks for your visit to my blog. Nice Post ! I follow you on GFC ( Rabea Schulte), please follow back ! Nice :-) I follow U maybe U follow me back?? would you like to follow each other on Google+ or Bloglovin or Instagram or all of that? Oh wow, the pigmentation is really good. I think have seen this brand here (maybe in Sasa) but has never tried it. I will definitely check it out when I hit the mall this weekend. yeah. the pigmentation is good. i think you can try this! Yes thanks for commenting on my blog! Following you now! This is a really cool and cute product. And you're so adorable. Thanks for visiting my blog. Sure we can follow each other. Just follow me, I always follow back. 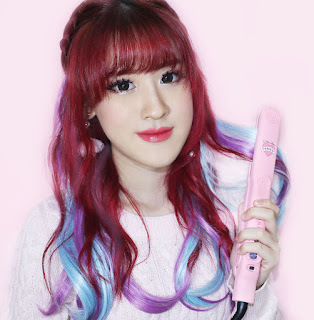 pigmentasi nya bagus yah, itu dipake di alis juga kan yah ?